As we have noted before, transportation is one of those governmental functions that is almost necessarily delivered on a regional basis. Yet two local concerns inevitably appear almost immediately in any discussion of a regional transportation system. Governance: what power does any one locality have over what services are provided? Equity: who pays, and who benefits? Our previous post suggested rather harshly that the Ann Arbor Area Transportation Authority was “exceeding its reach”. That judgment was based on the expectation that the AAATA will run up against those same two obstacles in its effort to achieve a somewhat more limited version of its county-wide 5-year plan. Here is the blunt truth: Township officials are conditioned by tradition and possibly legal constraints to spend money only to the extent that it buys a direct service. They will not easily contribute to a regional approach in which monetary contribution and location of service delivery are disconnected. But the very essence of a regional system is that resources must be made available to the entire system without regard to the source of the funds. Another blunt truth is that even when the money to be spent is not coming from township coffers, officials will be very cautious about subjecting their residents to taxation via a regional tax. One argument often made is that even though a “vote of the people” may be required for a new tax (such as a transportation millage), the relatively low-population townships and small cities can be “swamped” by votes from larger urban areas. One reason people choose to live in townships is the lower tax rate, and placing them in hazard of a new tax is politically unpopular. The limits of the expanded authority. Pittsfield retains its POSA, Saline does not participate. Ypsilanti Township not finalized. What is unfolding is that AAATA will not succeed in their broader plan. 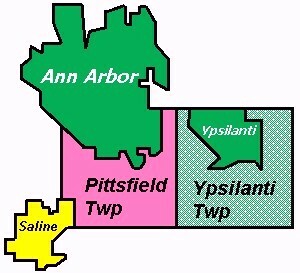 However, they will manage to bring in both Ypsilanti communities, on unequal terms. The final steps have now been taken (admirably summarized by the Ann Arbor Chronicle) to incorporate the City of Ypsilanti into the Ann Arbor Transportation Authority. It is now the Ann Arbor Area Transportation Authority, with one seat on the board designated to the City of Ypsilanti. (The Ypsilanti City Council must still approve the Transportation Funding Agreement , scheduled for November 5, but it appears unlikely that they will fail to do so.) By the agreement, the City will transfer its transit millage to the AAATA, less an administrative fee of 1%. This expansion of the AAATA to include the City of Ypsilanti solves the problem that they had run up against their ability to tax themselves adequately to pay the POSA charges required not only for their previous routes, but for the expanded #4 service and additional Night Ride service that were provided as part of the “advance implementation” of the countywide transit plan. 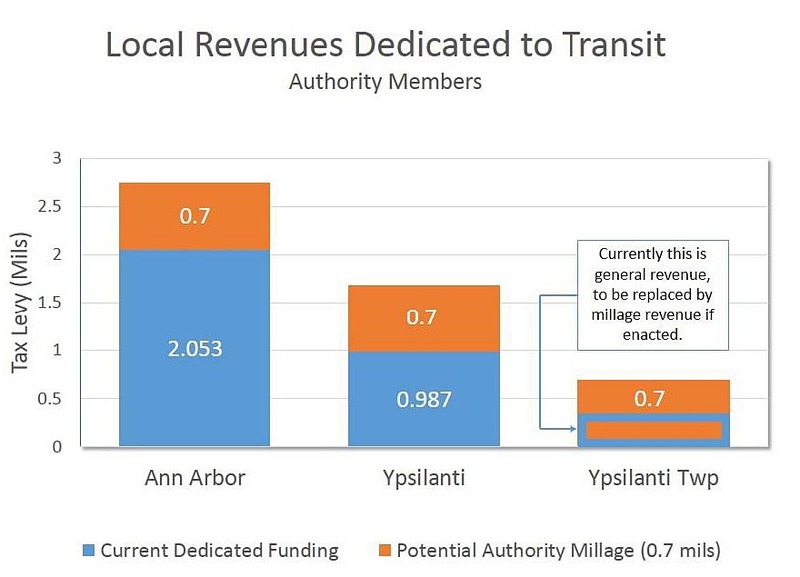 On practical terms, it means that Ann Arbor taxes are now supplementing Ypsilanti’s millage to provide transit to Ypsilanti. My own view is that this is a good bargain. Ypsilanti is our sister city and our success depends on their success, in community terms. The two cities together really are our “urban core”. The City of Saline was very supportive of the countywide plan and was one of the last to opt out. However, they do not currently receive service from AAATA; instead, they have a contract with WAVE. Evidently AAATA made a presentation to their City Council on July 1, and were turned down even for limited POSA service ($175,000/year). An informal newspaper poll showed a small sample were about even on the proposal (37 for, 41 against, 19 wanted a smaller proposal). The single commenter on the poll probably spoke for many others, “The City just raised taxes stating that there where no more places to cut. And here they go finding new places to spend the money that they confiscated from their own citizens.” It appears that Saline will not be a joiner in the near future. Authority in accordance with the State of Michigan Public Act 55 of 1963 and asks the AAATA Board of Directors to approve the request. As reported by the Ann Arbor Chronicle, the AAATA board approved the addition of Ypsilanti Township to the AAATA on September 26, 2013, despite urgings (mine) to examine the fine print more closely. My interpretation is that both parties have been proceeding from good intent but misleading impressions. This is essentially a “handshake” arrangement in which Ypsilanti Township, unlike the City of Ypsilanti, brings no fixed financial contribution to the table. All along, the Township has evidently been persuaded that they can better the services offered to their residents without any real cash on the table. In fact, Karen Lovejoy Roe suggested as much at an early urban core meeting – that if the authority-wide millage passed, they could remove the burden from the general fund. The material provided by AAATA staff reinforces that intent. 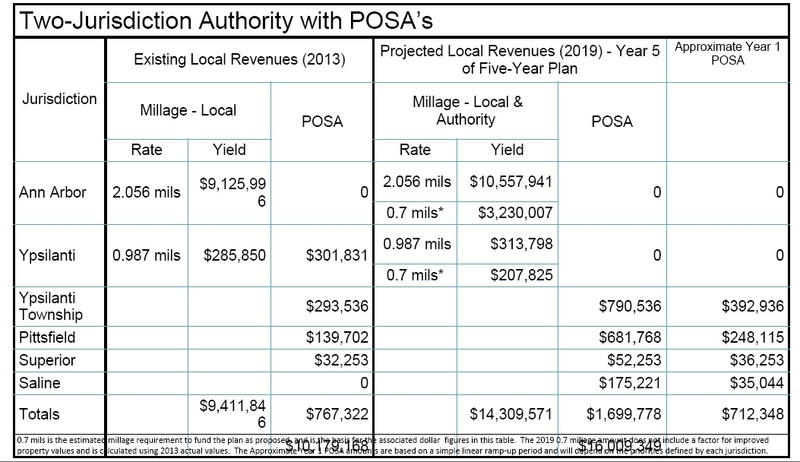 As the figure indicates, the promised POSA contribution from the general fund will be omitted if an authoritywide millage is passed. The new millage (paid by Ypsilanti Township residents as well as the other two communities) will also pay for expanded service in the Township. AAATA published a concept paper with many questions and answers. Question: If Ypsi Township becomes part of the AAATA organization, will they no longer have to pay for services under a POS contract? Answer: Only if Ypsi Twp becomes a member AND there is a successful millage, would Ypsi Twp stop paying for service from their general fund and start paying the full cost of service through their millage contribution. Question: Is there a backup plan in case new funding through a millage is not approved? Answer: If millage funding is not feasible for any reason, the AAATA will continue running the services already being provided, funded through existing mechanisms, including the POSA mechanisms that have existed for over thirty years. As property values continue to rise in Ann Arbor, AAATA revenues may increase sufficiently to add new services. We can also increase service to the nearby communities if they are willing to increase their POSA payments. So AAATA is running up against its limits. Although its administration has demurred on the plans for a millage, it is clear from all their planning documents that they are depending on the passage of one, perhaps in May 2014. They have brought no new revenue in through their expansion efforts, and have only succeeded in expanding the authority to include the two Ypsilanti communities. This will doubtless lead to more expectations (and probably needs) for increased service. (Note that the concept paper hinted that increased services would be available via Ann Arbor tax proceeds.) But to pass the millage, they will have to persuade the Ann Arbor public that they will vote in an additional 0.7 mills in taxation in order to accomplish this truncated expansion of transit services. UPDATE: The Ann Arbor City Council voted to postpone the resolution approving the addition of Ypsilanti Township to AAATA. See coverage by the Ann Arbor Chronicle . It will be taken up again on November 18, when the new Council is seated. SECOND UPDATE: Regarding the obligations of township governments to spend for the benefits of their residents: I have been provided with this article with a summary of lawful expenditures for township governments. 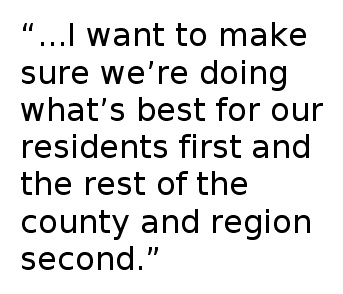 Clearly any township trustee would feel quite constrained in making broad commitments. THIRD UPDATE: The Ann Arbor-Ypsilanti Chamber of Commerce evidently intends to make a recommendation to the Ann Arbor City Council regarding the Ypsilanti Township addition to the AAATA. They invited me to present my views at a committee meeting on November 12. Here is the position paper I prepared for them. As you will see, it also includes an overview of tax equity issues for a future millage. FOURTH UPDATE: The Ann Arbor City Council voted to include Ypsilanti Township in the AAATA, but not without some debate. Here is the account by the Ann Arbor Chronicle. This entry was posted on October 20, 2013 at 10:11 pm and is filed under civic finance, Regional, Transportation. You can subscribe via RSS 2.0 feed to this post's comments. You can comment below, or link to this permanent URL from your own site.